I saw this watercolour float past and was fascinated by the weird behaviour of the people in the foreground, so I looked them up, but was unable to find anything about them but something that described them as ‘boys playing’. The one on the left in the orange jacket looks so 20th century! I did however, in the course of my researches, find this awesome article about what Ruskin really said about Kirby Lonsdale. He seems to have had Very Stern Views. Aren't they throwing stones at the construction on the... tomb? Unless Boy In Hat is a time-traveller, I suppose. Lol! Though I think the thing is a little bit too big for a phone; rather it may be a beer-can or smth that will go on the tomb the next round of stone-throwing. I suspect Ruskin was actually a right grumpy sod! yes, ruskin was depicted as very eccentric in the movie 'turner'. 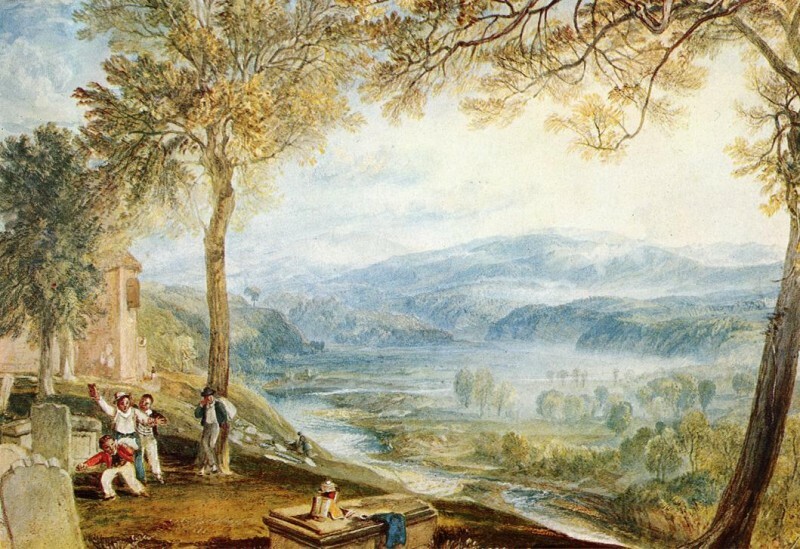 not the best known turner piece but very intriguing! yes, what are those people doing? great article on ruskin. of this i was unaware..
Don't hold back, Ruskin! Say what you really think! I think they're throwing stones at the pile of stuff. Not sure what the pile of stuff is -- it looks very breakable! It looks like a homemade version of the things where you throw balls to knock the cans off the shelf at the shows. The weirdest thing for me about that painting is that it looks nothing at all like the Lune, but does look quite a lot like Derwent Water or Borrowdale. Why paint a picture of one place looking like another place?